Conventional wisdom says low carbon emission electrically-powered aircraft look much further away than electric cars. Ground vehicles have low endurance owing to heavy batteries and limited range, so powering aircraft by electricity seems a very blue sky technology indeed. Fortunately Pioneers have never taken much notice of conventional wisdom and a series of improvements mean that some aspects of flight technology could be powered by renewable energy. If we look back at the early years of flying, we can see how rapidly aircraft developed since the Wright Brothers made their first 12 second, 120 feet flight in 1903: only six years later Louis Bleriot crossed the English Channel, a 22 mile flight in adverse conditions, and after the massive technological leaps for aviation caused by the First World War, Alcock and Brown crossed the Atlantic in 1919 in a modified twin-engined bomber. They flew 1980 miles, which is a 12 million percent increase over the Wright Flyer's first achievement in 16 years. Solar powered full-size aircraft date from the 1979, when Larry Mauro flew the Solar Riser hang-glider, which was powered by 350 watts of solar cells, which charged a helicopter battery which then powered an electric motor to fly to gliding altitude. 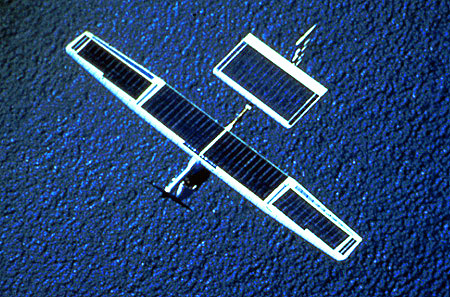 The Solar Challenger, a plane designed by Dr Paul Macready, flew 163 miles in 1981. Development in renewable powered-flight has been unspectacular over the next three decades but breakthroughs have been made. Naturally it is possible to use biofuels instead of aviation fuel, but this is not really a sustainable scenario. 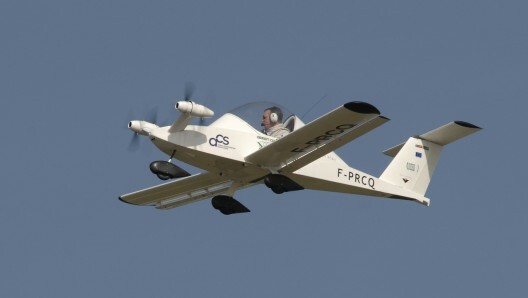 At the Paris airshow the Green Cri was unveiled by French technology firm EADS. It is an electrically-powered twin engine four propeller aerobatic aircraft based on an ultra-light design. EADS Chief Technical Officer said that the Cri "is a low-cost test bed for system integration of electrical technologies in support of projects like our hybrid propulsion concept for helicopters. We hope to get a lot of useful information out of this project." The Cri's contra-rotating propellers are powered by four brushless electric motors and energy dense lithium batteries. Such technology, combined with its lightweight composite structure, help it to achieve 30 minutes of cruise flight or 15 minutes of speedier aerobatics. More realistically, Boeing has just announced the unmanned SolarEagle project. Lightweight robot aircraft could take over surveillance, reconnaisance and telecommunications roles from fossil-fuel powered UAVs, Unmanned Aerial Vehicles. SolarEagle is projected to make its first demonstration flight in 2014. 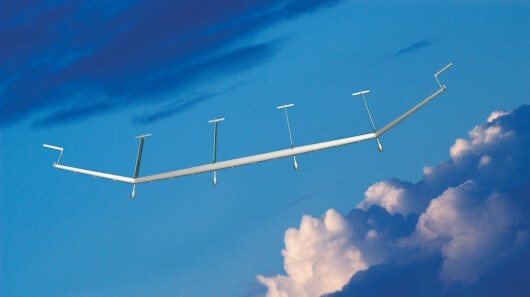 "SolarEagle is a uniquely configured, large unmanned aircraft designed to eventually remain on station at stratospheric altitudes for at least five years," said Pat O'Neil, Boeing Phantom Works programme manager for the plane. "That's a daunting task, but Boeing has a highly reliable solar-electric design that will meet the challenge in order to perform persistent communications, intelligence, surveillance and reconnaissance missions from altitudes above 60,000 feet." During testing, the SolarEagle demonstrator will remain in the upper atmosphere for 30 days, harvesting solar energy during the day that will be stored in fuel cells and used to provide power through the night. The aircraft will have highly efficient electric motors and propellers and a high-aspect-ratio, 400-foot wing for increased solar power and aerodynamic performance.